, a learned traveller, was the son of colonel Wheler of Charing in | Kent, and born in 1650 at Breda in Holland, his parents being then exiles there for having espoused the cause of Charles I. In 1667 he became a commoner of Lincolncollege in Oxford, under the tuition of the learned Dr. Hi kes, the deprived dean of Worcester,; but, before he had a degree conferred upon him. went tq travel; and, in the company of Dr. James Spon of -Lyonsj tpok a voyage from Venice to Constantinople, through the Lesser Asia, and from Zante through several parts of Greece tg Athens, and thence to Attica, Corinth, &c. They made great use of Pausanias as they journeyed through- the >; $jpumries of Greece and corrected and explained several traditions by means of this author. The primary object of these leaned travellers was to copy the inscriptions, and describe the antiquities and coins of Greece and Asia Minor, and particularly of Athens, where they sojourned a month. 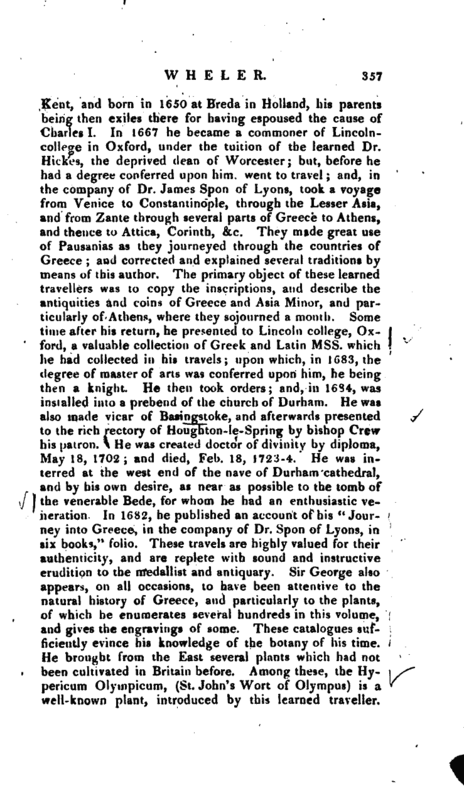 Some time after his return, he presented to Lincoln college, Oxford, a valuable collection of Greek and Latin Mss. which he had collected in his travels; upon which, in 1683, the degree of master of arts was conferred upon him, he being then a knight. He then took orders; and, in 1634, was installed into a prebend of the church of Durham. He was also made vicar of Basingstoke, and afterwards presented to the rich rectory of Houghton-le-Spring by bishop Crew his patron. 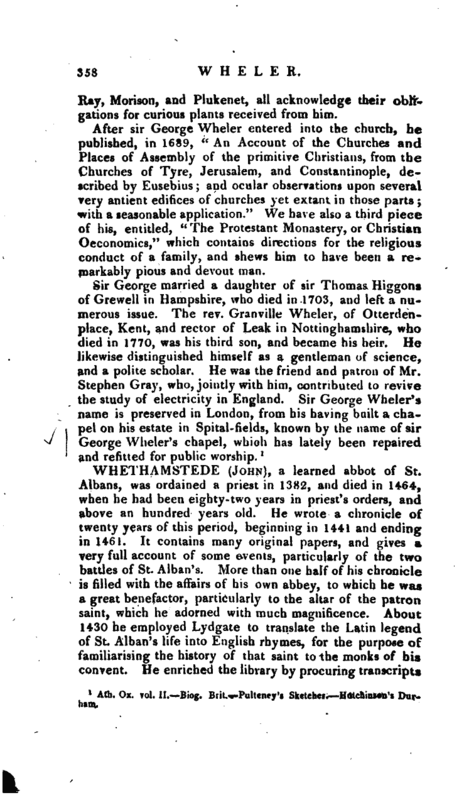 He was created doctor of divinity by diploma, May 18, 1702; and died, Feb. 18, 1723-4.“He was interred at the west end of the nave of Durham cathedral, and by his own desire, as near as possible to the tomb of the venerable Bede, for whom he had an enthusiastic veneration In 1682, he published an account of his” Journey into Greece, in the company of Dr. Spoil of Lyons, in six books," folio. These travels are highly valued for their authenticity, and are replete with sound and instructive erudition to the medallist and antiquary. Sir George also appears, on all occasions, to have been attentive to the natural history of Greece, and particularly to the plants, of which he enumerates several hundreds in this volume, and gives the engravings of some. These catalogues sufficiently evince his knowledge of the botany of his time. He brought fVom the East several plants which had not been cultivated in Britain before. Among these, the Hypericum-Olympicum, (St. John’s Wort of Olympus) is a well-known plant, introduced by this learned traveller. | Ray, JVJorison, and Plukenet, all acknowledge their obligations for curious plants received from him. 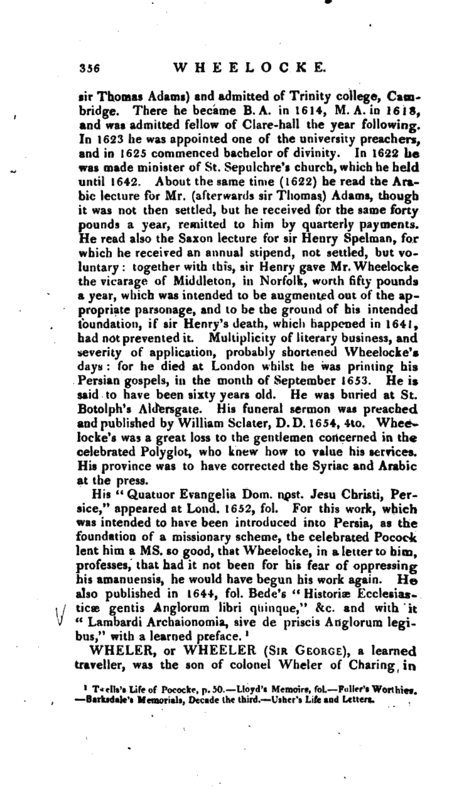 After sir George Wheler entered into the church, he published, in 1689, “An Account of the Churches and Places of Assembly of the primitive Christians, from the Churches of Tyre, Jerusalem, and Constantinople, described by Eusebius; and ocular observations upon several very antient edifices of churches yet extant in those parts; with a seasonable application.” We have also a third piece of his, entitled, “The Protestant Monastery, or Christian Oeconomics,” which contains directions for the religious conduct of a family, and shews him to have been a remarkably pious and devout man.